You'd think that smooth golf balls would travel farther than the dimpled ones we use today. And there's actually some fun physics behind the dented ball design we see on today's golf courses. Let's imagine a smooth ball flying through the air. As the ball travels, its front surface will come into contact with the air. That air will then smoothly go over the front and separate from the ball towards the back. That separation leaves a "turbulent wake region" behind the ball, which creates drag on the ball. However, if we add dimples to our theoretical ball, we will be able to minimize the turbulent wake and, therefore, the drag on the ball. 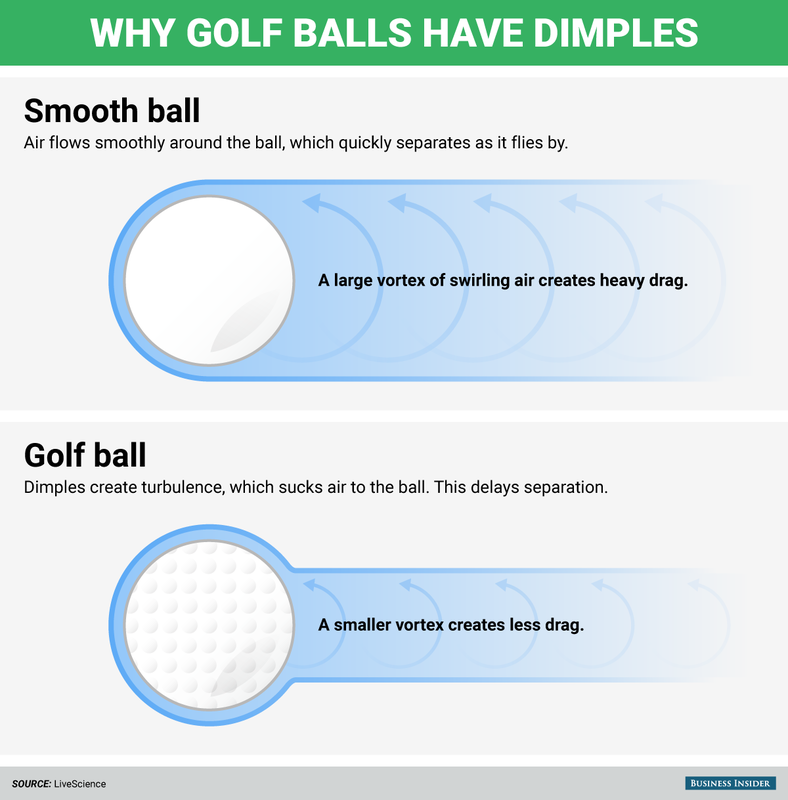 "The dimples on a golf ball create a thin turbulent boundary layer of air that clings to the ball's surface. This allows the smoothly flowing air to follow the ball's surface a little farther around the back side of the ball, thereby decreasing the size of the wake. A dimpled ball thus has about half the drag of a smooth ball." Additionally, dimples also help with lift. A smooth ball gets lift from backspin, which makes the air pressure on bottom of the ball greater than on the top, thus creating an upward force on the ball. But while "ball spin contributes about one half of a golf ball's lift," continue Veilleux and Simonds, "the other half is provided by the dimples, which allow for optimization of the lift force."